Sometimes, you just can’t help falling in love with a new dog or cat. But if you’ve already got a pet at home, you may be feeling a bit anxious about bringing home a new four-legged family member. While they may soon become fast friends, your new pet and your original pet may not hit it off right away. Cats can be territorial, and dogs may find it difficult to cope with the presence of a new dog vying for your affection. However, there are a few things pet owners can do to smooth the transition and promote household harmony between pets. Nearly 80 million homes in America have a pet, and 42% of those households have multiple pets. If you plan to become a multi-pet household, there will inevitably be a time in which you must introduce your new pet to an existing pet. 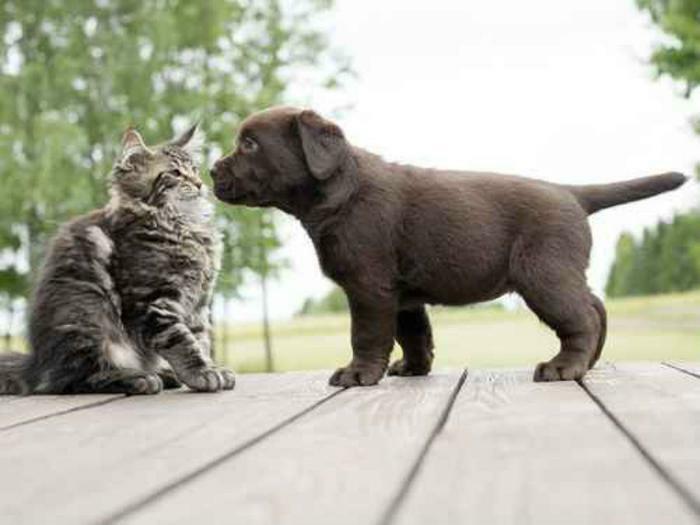 Whether you’ll be introducing a dog to a cat, a dog to a dog, or a cat to a cat, the experts at Healthy Paws Pet Insurance say there are right and wrong ways to go about welcoming a new pet into your home. Here’s what pet parents can do to snuff out early animosity in favor of a friendship between pets. Dog meeting dog. Don’t bring your new pup into your home right away. Instead, go for a walk in a neutral area with your dog and bring a friend along to walk your new dog. Walking is a great way for dogs to bond and gather information about one another. Cat meeting cat. Avoid putting your new cat in a room with your existing cat right off the bat. Instead, keep your new cat separated and let the cats smell each other first. Additionally, cat owners should make sure to have new toys and beds for their new cat. Cats who previously ruled the roost solo may not take kindly to having their belongings taken over by a new member of the family. Cat meeting dog. Cats and dogs may be different, but they are capable of happily sharing a home. To ensure cats and dogs start off on the right foot, keep them separated for a few days and allow them to become familiar with each other’s scent. Once they seem relaxed and calm, allow them to be in the same room but keep the dog leashed. This can be repeated until both pets are calm and the dog ignores the cat. Slow, gradual introductions are best as big changes can be stressful for pets. If pets don't seem to be adjusting to each other's presence as well as you'd hoped, consider enlisting the help of a veterinarian or animal behaviorist who can get your pets on the right track.